I’m back! I know, it’s been a while since I have added anything to my website. Life has been hectic and full of changes. To some that may sound fun, but to a person like me who doesn’t like change, it’s been a journey. As we started packing up the house in preparation for the move, the thought of leaving was hard. What I wasn’t prepared for was the actual moving day. Thankfully we had a moving company to actually load and move all our stuff so I figured it would be an easy day. Or at least that was what I had thought but it had been a while since we had moved so I forgot about what moving day was like. After the moving trucks left, along with my husband, I was left to clean an empty house. This is the part I wasn’t expecting. The emotions of standing in an empty house that was full of great memories. From celebrating my son’s first birthday to bringing our daughter home from the hospital to Thanksgiving gatherings and first day of school pictures on the porch, my mind was flooded with great memories. If I am being honest, I stood there and did my best to hold my tears in. So while it was hard, it was also a good thing. After the memories past, I looked at the rooms differently. This was no longer our home, it was just an empty house. The memories didn’t stay with the house, they were coming with us. And home was wherever we were. Since my husband left early to guide the movers at to where the furniture and boxes should go I didn’t have to worry about that part. By the time, the kids, dog and I got to the house, the movers were already gone. The control side of me was wondering how my husband was going to have the furniture set up. Since we were moving into a place that was less than half of our old home, we weren’t sure what furniture was going where and what was being stored. 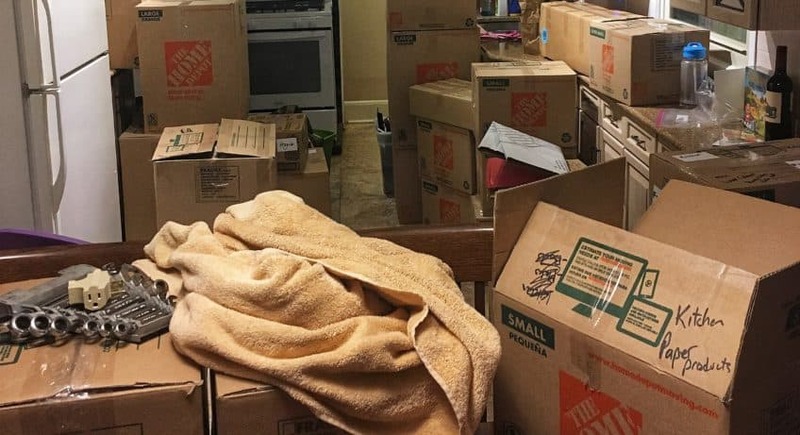 My husband did a great job and it was nice to walk in and if you were blind to the boxes everywhere, it actually looked like it could be home. Unfortunately, it’s hard to ignore boxes when it is like an obstacle course to walk anywhere. They were stacked everywhere! Our kids labeled our home “Box City”. I learned that is it hard to relax when you see boxes everywhere you look! So, of course, the first and most important task was getting cable and internet set up. I know that sounds ridiculous to some of you and it may be. For us, with 2 kids and all their belongings packed in boxes, we needed something for them to do. Also, by the time it got to evening, we were tired and just wanted to sit on the couch, put our feet up, turn on the TV and relax. To add to our chaos, the day after we moved we had a showing on our house, so we had to go back the next morning to finish loading items into our SUVs and do some additional cleaning. That evening, there was a welcome picnic with the leadership from my husband’s new job. It was a really tiring couple of days. There were some bumps getting it set up but thankfully after a couple days, we could finally move on to opening a box to unpack. (Thankfully our moving company moved our dressers with our clothes still in them so we didn’t have to hunt for clothes). Just how I forgot how much work packing was, similarly I forgot how much work unpacking those same boxes was. Once we decided where things were going, most of the unpacking went smoothly. After three weeks, I would love to say that we are fully unpacked but of course, we aren’t. 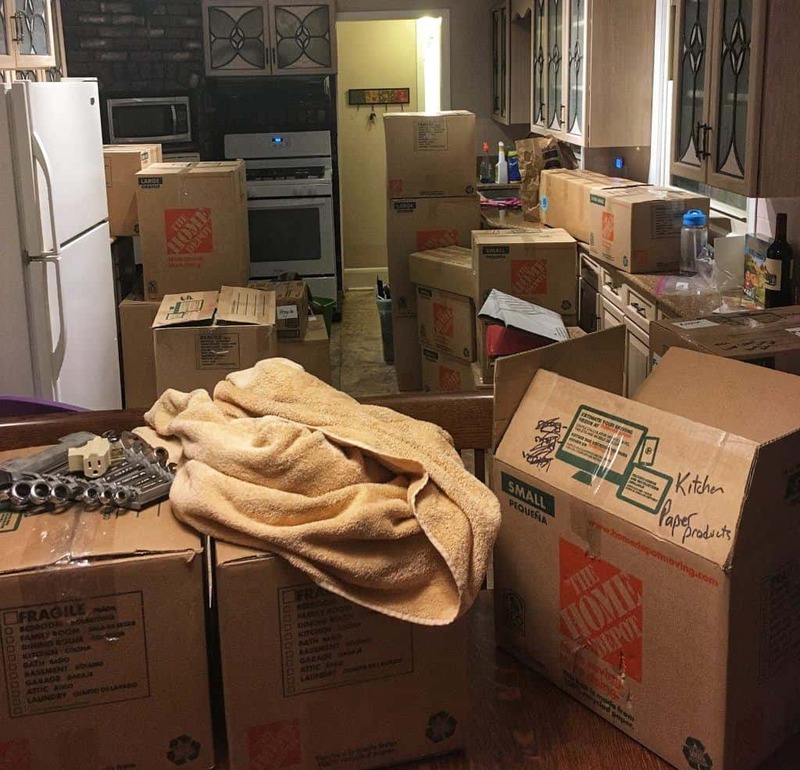 Once we got to the point of living relatively normally – meaning we could cook, eat, brush our teeth, etc – my motivation to unpack the rest of the boxes vanished. I don’t think it will come as a surprise but I think the most difficult aspect of the move was the mental and emotional aspects. Even though we were only moving about an hour away, we were leaving “home”. We were leaving family, friends who had become family, our home, our church, great school, an amazing town that was the perfect balance of city and small town. We were leaving it all behind. I knew this was God’s plan for us to move but that didn’t mean it wasn’t difficult. It was hard for me and the kids, especially as I thought about leaving that all behind. I am more of an introvert so the thought of starting all over is a lot. The kids leaving literally everything they know has been a difficult experience. It’s hard when your kids are struggling and you can’t do anything. Obviously, we aren’t moving back, so how do you fix that? Right now, I am just praying that they will find good friends and in time, this will become home. I don’t want to imply that it hasn’t been hard on my husband because it has, as he has left all the same relationships and comforts behind. He does have the benefit though of routine. He actually started his new job before we moved, so his “new life” has already started while the kids and I are still in a little bit of limbo. Thankfully soccer and school will be starting soon so I think that will help the kids start to live life here. So now what? Well, my first priority right now is to finish unpacking and making our new house our home. I also am going to focus on supporting my husband with his new career and my kids with their new school. I want to be the constant. Regardless of where our house is located, I want them all to realize that when they walk through our door, they are home. Obviously, if I could go back through this whole process, I would make a few changes (most of those revolve around packing). I am thankful though that the entire process went relatively smooth. 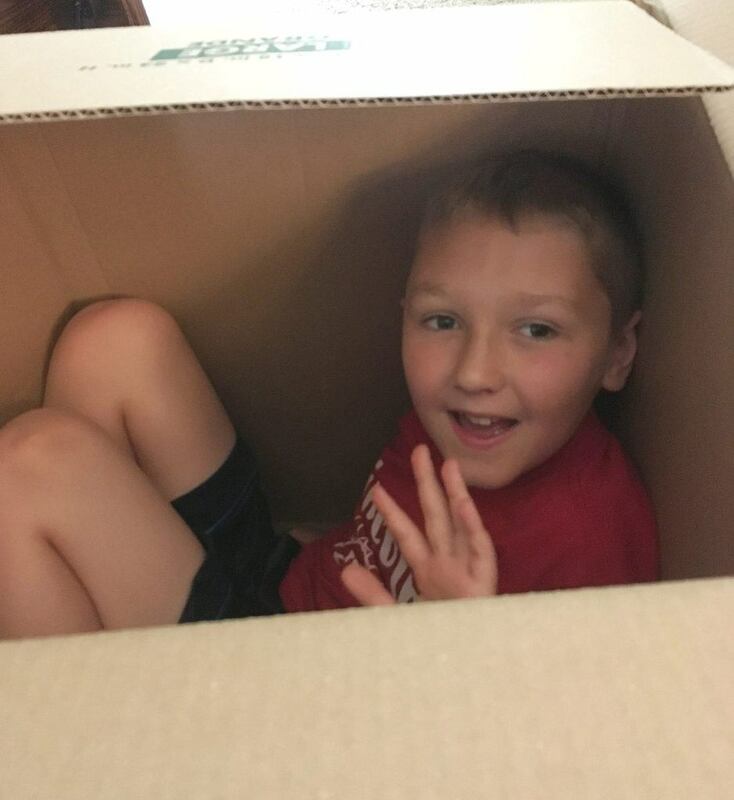 We have a home that fits our family needs, a new job that my husband loves, nothing broke during the move (an amazing feat especially based on how we packed at the end!!) and that “home” moves with us. So while I don’t like change, there is something refreshing about a new start. Have you struggled through a move? Either physically or mentally? I’m sure there have to be some funny moving stories out there….well funny now but not at the moment. I would love to hear your stories or if you have any advice on settling in. Please share in the comment section below. I have Autism so I know what you mean when you say you don’t like change – I planned everything meticulously but somehow there is always something to surprise you. At my last house move, when we arrived (with our perfectly packed up Removal Van – all of the important items ready to take out first!) we discovered that for some reason the key to the front door didn’t work and the only access we had was to the Garage. My very impatient van driver insisted on unloading everything into the Garage instead of waiting for the locksmith – which meant by the time we could actually get into the house, which was after dark – all of our belongings were stacked inside the Garage – of course, the most important things trapped at the back! We spent the night sitting up on the sofa with various blankets and some bottles of water!! Hey ho! Wow, thankfully our move when smoother than that. It’s the worst when you are so prepared and then something happens that you can’t prepare for! Such a good read! I’ve only moved once, but that was when I got married, so I didn’t have a lot of belongings! I can just imagine how long the process is when you have lived in a house with more things! This is our 6th move in 18 years and every time we get rid of so much stuff. And yet, every time we accumulate even more stuff!! This sounds exactly like our crazy move and looks like it too! We packed for months before because I wanted it to be so easy but the days before our move it felt like we had just SO MUCH MORE to pack!! Boxes were everywhere and consumed our new house but luckily I got them done pretty fast so now I just have lots of boxes full of empty boxes!!! It will get done and a fresh start is great sometimes like you said!! You will always have the memories of the other house to take with you!! I am thankful for the memories. We have a ton of empty boxes but thankfully they have bulk garbage/recycling days once a month! We will be taking advantage of that this month! Oh man as someone who has a moved a few times in the last few years I don’t envy you! Our last move was the hardest emotionally as we were leaving a house we really loved and my three year old was sad to move! Good luck getting settled in! Wow, a few times in a few years. We at least had 9 years 🙂 But we did love the house we left. My #1 tip is to get to know the neighbors — friends can really make a new place feel more like home. Good luck settling in! I love how home just feels like home. When I have a rough day out and about, I come home and feel like I can breathe again. When we go on vacation for awhile and then drive into the garage, I feel like I can finally relax and breathe again. And it just takes time, at least for me, for any place to become that home. I agree, there is definitely something about being home.